Looking to fill up your iPhone or iPad with free apps? 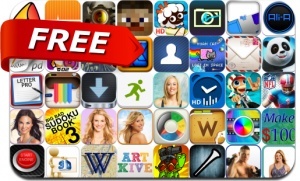 Great apps go free on a regular basis, just like these 40 apps. This apps gone free alert includes TriZen, NFL Kicker 13, Donut Dance, Cube Racer, Nyan Cat: Lost In Space, Paper Train, Shellrazer, Big Bad Sudoku Book, Nitro Chimp, AliA, 3000+ 3D Wallpaper, LightBomber, Postale, TrendMe, Pocket Letter Pro, aTimeLogger 2 and many others.